This Father’s Day, we’re honoring the men who make help make our members Unstoppable. 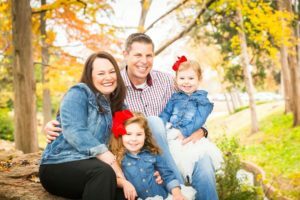 Learn what Daniel Campbell, husband to JLOC President Pam Campbell, likes being about a dad and what he enjoys about JLOC. I love playing with my girls, Grace and Olivia. I really enjoy having fun and laughing with them. Pam and I have been married for five and a half years. Working for Cox Communications, we met while volunteering at a water stop for the Oklahoma City Memorial Marathon. We were friends for many years before we started dating. What are some of your favorite JLOC events? What is the one thing that has surprised you as a dad? I was surprised to discover how much “stuff” children need, especially little girls. Do we really need that many bows? How are you helping your girls grow up to become “unstoppable”? I want to help them have confidence in themselves and know they can do things for themselves, yet I will always be here to support, defend and cheer them on. Tell us your favorite dad joke. Is there anything else you’d like to share with us about being a father? Even though it is hard sometimes, I feel fortunate that I get to be a dad to these two amazing girls. They challenge me every day to be my best.